Cryptocurrency selloff has resumed after a Thanksgiving respite with all major virtual coins trading lower on Saturday. The flagship cryptocurrency, Bitcoin (BTC) has been seeing its price decline significantly in the past few weeks, so much so that it went below the $5,000 level for the first time since October last year. According to an experienced analyst, the crypto’s apocalypse is far from over. Meanwhile, other analysts, as EarnForex covered, have predicted that the current bear market will see the price fall to $2,000 or $3,000. The co-founder and CEO of the Bitcoin Mercantile Exchange (BitMEX), Arthur Hayes believe that the current downward momentum which is already nearing a year in length may continue for another year to 18-months. 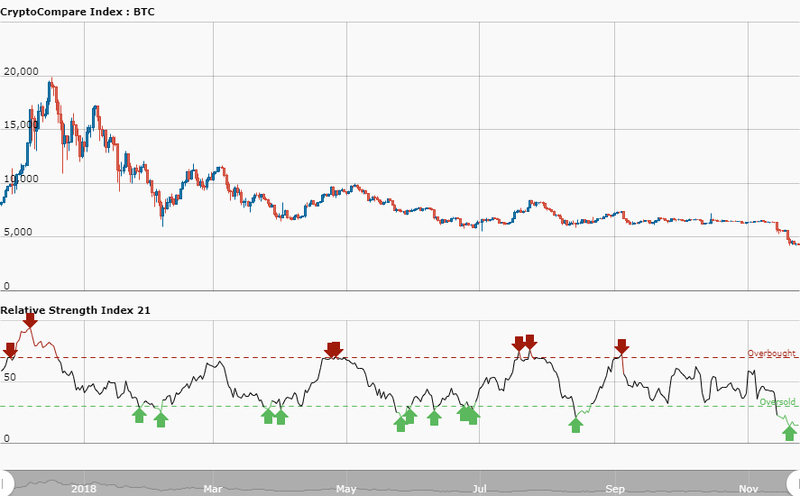 At press time, Bitcoin price seems to be on its way to $4,000 according to CryptoCompare data shown below. The digital coin is trading at $4,279 at 20:00 GMT after falling 0.8% in the past 24 hours. The latest data from Google Trends for Bitcoin search interest has started rising significantly this month after the price of most cryptocurrencies crashed. The search interest for the flagship cryptocurrency has been correlated with the price so far, which has seen some analysts point to a possible future bull run. The searches for the keyword “Bitcoin” started the uptick at about the same time its price started the downward trend and it is higher now than during any weekly period since April 8, at which time its price began a major rally from $7,000 to closer to $10,000. The rise in search interest for the digital coin can presumably be attributed to various mainstream news outlets picking up on the cryptocurrency’s price performance in what some have claimed were hit pieces. It is also worthy of note that Bitcoin’s search interest hit an all-time high at about the same time its price did as well. In December 2017, when the price of Bitcoin climbed to $20,000 all-time high, its search interest hit 100 on Google Trends. Based on this, some crypto analysts have suggested the rise in search interest could as well lead to a price rally, as was the case in the past. While some believed a trend reversal would come in December 2018, Bakkt announced recently their decision to postpone the launch of their highly anticipated Bitcoin Futures trading platform until January 2019. There has been a lot of interest and talk about institutions venturing into the crypto sphere. For instance, we have seen in recent months KPMG’s bullish crypto report, both Binance CEO Changpeng Zhao and Bitcoin Bull Mike Novogratz predicting institutions embracing crypto as inevitable, as well as countless other remarks about institutions circulating in the cryptocurrency community.